A networked, real-time strategy game written in Python. Check it out on github! A screenshot showing the radial menu, mini-map, heads-up display, and 3 competing players. 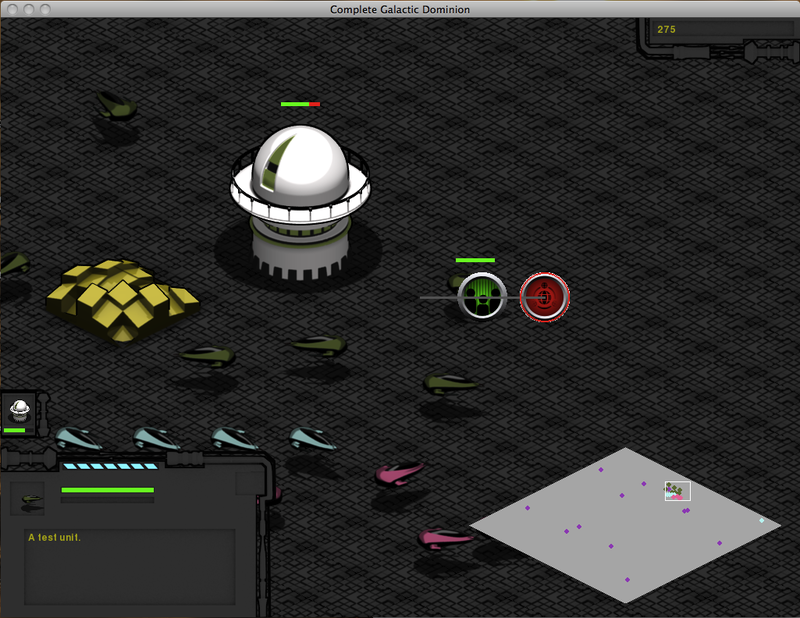 The core concept of Complete Galactic Dominion is that each player begins with a world in a much larger universe. The ultimate goal is to develop and expand your civilization to create an intergalactic empire. Without previous experience in game design, my team spent a lot of time researching game architectures, creating system diagrams, and working towards intermediate goals on the way to larger goals. We created a networked, real-time strategy game in Python complete with isometric graphics. Players could battle or compete for resources within a world in order to develop and expand their civilizations.